Combining high strength steel fabrication with the latest thermoplastic coating technologies gives these tables corrosive-free and maintenance-free properties. 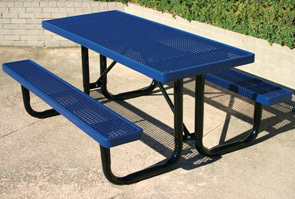 The picnic tables maintain high quality at an economical price by using slightly less steel around the edges. Expanded metal tops and seats can be finished with a lightly textured matte Polyethylene in the color options as shown below. 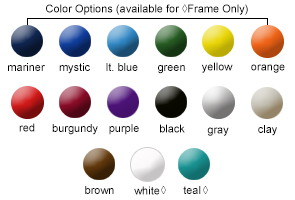 Powder-Coated 2-3/8" O.D. welded legs and frame make these traditional tables the strongest and most durable on the market. All rectangular tables have rounded corners for added safety.